This morning, I saw someone tweet an article called "Gaming Journalism versus Nintendo." Catchy enough headline. I had to check that one out. According to Rogers, an indie game studio named AckkStudios took an interview with a large gaming website the week after Hurricane Sandy. "Hey wait a minute," I thought to myself. "I work for a large gaming website. And I interviewed an indie game studio named AckkStudios the week after Hurricane Sandy." According to Rogers, the folks at AckkStudios were upset that the interview had not yet been posted on that large gaming website. Rogers wrote that AckkStudios thought the interviewer only wanted to talk about how Nintendo mistreats indie game developers, and when AckkStudios wouldn't comply, the large gaming website decided not to post the article. "That's not really how my interview with those folks went," I thought, "but my interview still isn't live. November has been so busy, and I haven't had a chance to transcribe it yet. Is she really talking about me?" Then Rogers started getting more specific. "For the record, I'm NOT talking about IGN, GameSpot, Eurogamer, or Destructoid," she wrote. "The site I'm speaking of is just as well known as those sites though." Okay. That certainly narrowed it down. Rogers continued: "The irony is that the top guy behind this site has been regularly defending gaming journalism when his site has been the biggest contributor in manufacturing click-bait controversy." Could this have been a reference to our editor Stephen Totilo's recent story about game journalism? "For the big site I am referring to, it has quite a negative reputation from Nintendo fans," she wrote. "Some gamers have made past claims that this site has an agenda against Nintendo, and I never believed it. I just assumed that Nintendo fans were being way too sensitive and defensive about any criticism against Nintendo. But now I'm starting to think there might be some kind of an agenda from this site." While I certainly don't think Kotaku has an agenda against Nintendo, I've heard complaints like that before. This didn't seem like a coincidence. So a few hours after the article went live, I sent an e-mail to the folks at AckkStudios expressing my disappointment and explaining why my interview with them had yet to be published. They responded with an apology, and denied that the article was about us—"You guys were great in your interview, and we really enjoyed doing it," AckkStudios co-founder Brian Allanson told me—making the whole situation even more confusing. Rogers continued to deny that the article was about Kotaku, although I couldn't shake the feeling that it was. So I sent her an e-mail asking if she'd hop on the phone—she said no, and she wouldn't comment on the record for this story—and I re-listened to the audio recording of my interview with AckkStudios. It certainly didn't seem leading. In the 37-minute conversation, we spent maybe two minutes talking about Nintendo's policies, and the talk never turned negative. I thought their game was very interesting, and I told them as much during our conversation. So I gave AckkStudios another call to clear things up. Speaking to me on the phone this afternoon, Andrew Allanson, Brian's brother and co-founder of the company, told me he thinks Rogers' article was a series of miscommunications and incorrect facts. He said he did indeed think Rogers was talking about Kotaku, as AckkStudios had not had any other interviews with large gaming websites. He said they spoke to several European magazines and websites, and that they had received a call from someone who claimed to be from IGN (and said he would call them back later, but never did), but he couldn't recall any other recent interviews. Allanson added that they had talked to Rogers about their interview with me, but he said they hadn't told her anything that she had written—"I had no idea she was writing an article about this," he said—and he said he asked Rogers to take the article down. "She did exactly what she was accusing other people of doing... She is probably linking a lot of unrelated things," he said. "It's just bad journalism." Rogers would not speak on the record for this story, although she has said on Twitter that she "removed the article to prevent any politics for the studio." Rogers also has some history with AckkStudios—according to the Allansons, she helped facilitate their relationship with Nintendo by writing an article about their game, Two Brothers. "Within maybe three days of the article being up, we were contacted by Emily, who said she was in touch with someone at Nintendo of America and they wanted to put us in touch with a representative," Andrew Allanson told me in our initial phone interview three weeks ago. "Within maybe two weeks of getting in touch with Nintendo, they gave us the go-ahead to start developing for the eShop." It's a messy situation, and I don't know exactly what conversations have gone down between Rogers and the folks at AckkStudios over the past few weeks, although it has become clear both to me and Andrew Allanson that the negative article was indeed about Kotaku. It's too bad. Their game sounds really interesting. Some games tangled in controversy are not worthy of attention. This one certainly seems to be. Two Brothers, a game developed by the two brothers Brian and Andrew Allanson, looks and sounds fascinating. The Allansons first started working on the game in January of 2010 as something of a hobby in addition to their full-time jobs—Brian is an artist for iOS apps, and Andrew composes music for films, concerts, and games—and eventually decided that it might just be good enough to release. "On the weekends, Brian will work literally from 8'o'clock in the morning until... 3'o'clock in the morning," Andrew said when we all spoke three weeks ago. "It's only gotten crazier since we started working on it. I don't think we ever entirely intended on finishing it until it eventually kind of proved to be something we wanted to make. So Brian has put in a lot of time into it on the side. We eventually realized it had something, it had some potential to it." "The sort of stereotype of Nintendo being difficult to work with as an indie developer... I feel like they're trying to fight against it." Late this summer, they launched a Kickstarter for Two Brothers. It earned just over $16,000 in funding, selling itself as an old-school action-RPG designed to appeal to your nostalgia-loving soul. On first glance Two Brothers looks straight out of a Game Boy Color, and the brothers say that's intentional. 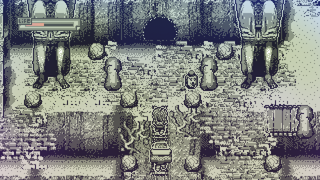 Color plays a large part in the game, which the Allansons say was inspired by the likes of Secret of Mana and Link's Awakening. The whole plot revolves around color. You play an inventor who, after a near-death experience, envisions an after-life filled with colors, and starts to become obsessed with seeing and re-discovering those colors. So that's your job. It's rather non-linear, the Allansons say—they compare the game to Shadow of the Colossus in that you'll be exploring the world and hunting down colors in any order you choose. One section, for example, tasks you with going out to the ocean, finding a color, realizing it was swallowed by a fish, finding a fishing rod, fishing for that fish, and then making your way inside of it to track down that color. "In the game, one thing we should point out is that everyone lives inside of animals," Andrew said. "Why do people live inside of animals?" I asked. Touché. Two Brothers was originally slated for PC, OSX, and Xbox 360, and now that the Allansons are licensed Nintendo developers, they plan to bring it to Wii U too. They say their experience with Nintendo has been nothing but pleasant, and that the only real restrictions involve in-game advertisement and product placement. They can charge what they want and add whatever they'd like without worrying about an outside force enacting creative control over their product—Nintendo gets final approval, but the Allansons say that's mostly for bug-catching and quality-controlling. "It's refreshing to hear that you guys are having this experience with Nintendo," I said, noting that Nintendo boss Reggie Fils-Aime had made some disparaging comments about "garage developers" in the past. "I'm relieved because I didn't know what to expect," Andrew said. "As soon as it was very clear that they had a direct business plan with how they want to work with indies, and that everything was very fair, the sort of stereotype of Nintendo being difficult to work with as an indie developer... I feel like they're trying to fight against it." "We're not promising it'll be as good," Brian said when I pointed out what a lofty promise "3D Earthbound" would be to so many RPG fans. "But we promise it'll be inspired."